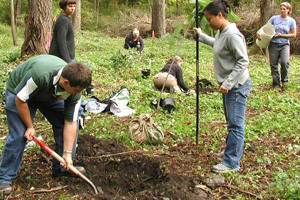 April 25 & 26, Arnot Forest, Van Etten, N.Y.
Camp Mushroom is a unique beginner/intermediate level workshop for those interested in small-scale forest mushroom cultivation. Join Professor Ken Mudge and extension educator Steve Gabriel for a fun and technical presentation of all the latest cultivation strategies and research, much of which has been based at Cornell over the last eight years. Participants will be trained in three methods of mushroom cultivation; shiitake on bolts, lions mane/oyster on totems, and stropharia in woodchip beds. In addition laying yard and management considerations will be covered. Each participant will also inoculate two shiitake blots to take home. Come visit the 90+ year old grove planted by Professor Lawrence MacDaniels which features selected hickory and walnut varieties and a full demonstration of forest farming practices including mushroom cultivation, medicinal plants, an ornamental nursery, and fruit production (paw paw and elderberry), and water management techniques including swales and hugelkulture piles. Tours by professor Ken Mudge, who re-discovered the nut grove in 2002, will be offered at 1pm, 2:30pm, and 4pm. 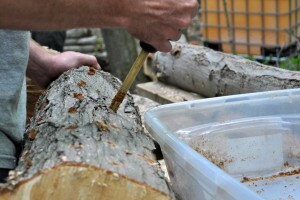 Try hands-on inoculation of mushroom logs and see grafting demonstrations. Taste nuts and enjoy an afternoon in the woods, which is adjacent to the East Hill Recreation Trail for longer hikes. Good fun for the whole family. More information about both events.